AIIMS Entrance Examinations 2019 Key Dates: All India Institute of Medical Sciences offers various medical related courses. And these courses are DM/M.Ch (3yrs. )/MD (Hospital Administration), Fellowship Program, PG (MD/MS/M.Ch (6 years) /DM(6 years)/MDS), M.B.B.S. ,B.Sc. Nursing (Post – Basic), M.Sc. Courses, B.Sc.(Hons.) 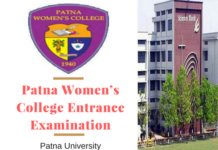 Para-Medical Courses, M.Sc. Nursing. 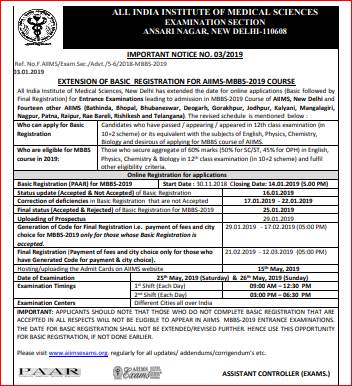 AIIMS 2019 Basic Registration will start from 30 November 2018. Among such programs, the highest degree level that the AIIMS offers is Ph.D. The exam of AIIMS happens more than once in a year like there is a January session, a July session, etc. 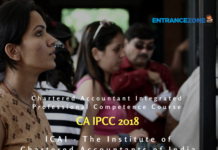 Candidates can accordingly fill the form for the session which is most suited to them. AIIMS MBBS 2019 Final status of Basic Registration has been issued by login. Applicants need to generate code from 06- 17 February 2019. The Re-uploading of rejected images AIIMS MBBS 2019 can be done from 29 January- 03 February 2019. AIIMS MBBS Basic Registration has been extended till 14 January 2019. 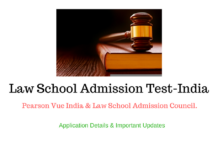 Admission process for B.Sc. (Nursing), B.Sc. Nursing (post basic) and B.Sc. 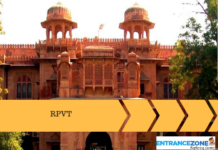 (paramedical courses) at All India Institute of Medical Sciences (AIIMS) New Delhi, Bathinda, Bhopal, Bhubaneswar, Deogarh, Gorakhpur, Jodhpur, Kalyani, Mangalagiri, Nagpur, Patna, Raipur, Rae Bareli, Rishikesh, and Telangana is started now. AIIMS PG 2019 admission Counselling for 6-year courses of January 2019 session has been started now. 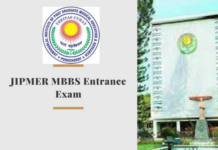 All India Institute of Medical Sciences MBBS 2019 Complete Exam Schedule has been declared. AIIMS 2019 Basic Registration has been started from 30 November 2018. Click Here to check the dates and the PDF. 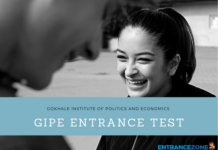 Key dates* of Entrance Examinations to be conducted during the year – 2019. Given below are those dates. 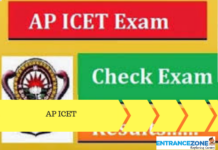 These dates can be helpful for the aspirants to prepare for the exams. 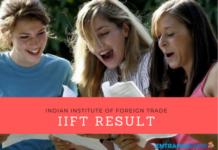 AIIMS MBBS 2019: The Re-uploading of rejected images AIIMS MBBS 2019 can be done from 29 January- 03 February 2019. AIIMS MBBS 2019 registration process will begin 30 November 2018. 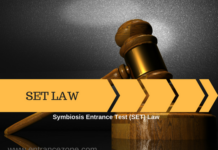 It is the newly introduced two-tier registration procedure. 2.5 lakh medical aspirants will appear in the entrance exam. 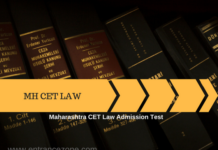 It is one of the biggest entrance exams in India. 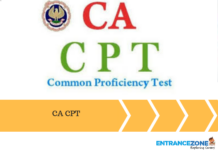 Candidates who have passed OR appearing in the 12th class examination (in 10+2 scheme) or its equivalent with the subjects of English, Physics, Chemistry, and Biology can apply. Applicants may apply for the exam at the official website aiimsexams.org. The basic registration process will be extended from 03 January 2019 to 14 January 2019 and formalities of the final registration process will continue till 12 March 2019. Note: Please visit the website www.aiimsexams.org for an update etc. 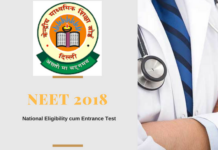 The National Eligibility and Entrance Test (NEET UG) is a medical entrance examination is an important examination as it is becoming a single window admission test for MBBS and BDS. 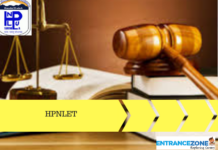 And NEET is conducted by the Central Board of Secondary Education (CBSE) till 2018 and later on NEET 2019 will be conducted by National Testing Agency. The updates can be checked on the official page of AIIMS Entrance Exam 2018 Here. 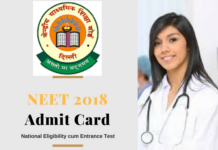 aiims 2018 registration, aiims 2018 form, aiims 2018 application form, aiims 2018 login, aiims 2018 online application, aiims 2018 exam date, aiims pg 2018, aiims login, aiims 2019 registration, aiims mbbs registration 2019, aiims 2019 application form, aiims 2019 application form date, aiims exam 2019, aiims exam date 2019. Can I do correction in Application form after final submission?